Millions of Americans may have heard on the news last week that a recently released study, “Increasing incidence of metastatic prostate cancer in the United States (2004–2013)” which was e-published in the journal Prostate Cancer and Prostatic Diseases on July 19, 2016, shows metastatic prostate cancer was increasing dramatically in the United States. However, in response to this article, researchers from the North American Association of Central Cancer Registries (NAACCR, Inc.) analyzed data collected by cancer registries across the United States and found that rates of metastatic prostate cancer rates are stable. Millions of Americans may have heard on the news last week that a recently released study, “Increasing incidence of metastatic prostate cancer in the United States (2004–2013)” (http://www.ncbi.nlm.nih.gov/pubmed/27431496) which was e-published in the journal Prostate Cancer and Prostatic Diseases on July 19, 2016, shows metastatic prostate cancer was increasing dramatically in the United States. However, in response to this article, researchers from the North American Association of Central Cancer Registries (NAACCR, Inc.) analyzed data collected by cancer registries across the United States and found that rates of metastatic prostate cancer rates are stable. According to NAACCR, the reason for the discrepancy between this study and other published literature is that the wrong measure was used for incidence by the authors of the study. The authors equated a change in the count of metastatic stage to an increase in risk in metastatic prostate cancer. But counts of cases do not answer public health questions about risk and using counts can result in misleading conclusions. To compare risk of prostate cancer in two populations or the same population over time, we must use age-adjusted incidence rates. In response to this article, NAACCR researchers, using NAACCR’s Cancer in North America (CiNA) (a population-based dataset covering 97% of United States population including data from the Centers for Disease Control and Prevention (CDC) National Program of Cancer Registries (NPCR) and National Cancer Institute (NCI) Surveillance, Epidemiology and End Results (SEER)), showed that metastatic (distant stage) prostate cancer incidence rates, a measure of risk, were virtually unchanged between 2004 and 2013 (Figure 1). Use of PSA for prostate cancer screening is now no longer recommended and fewer men are electing to be screened by PSA. 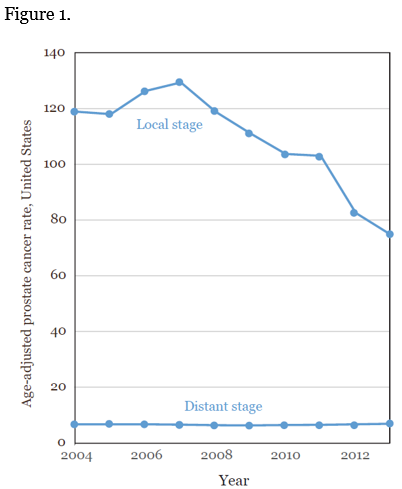 Consequently, fewer asymptomatic, local stage cases are being diagnosed, as seen in the top line of Figure 1 (located here http://news.naaccr.org/wp-content/uploads/2016/07/R.png). NAACCR also notes that the data set used by the authors was not population-based and represents a subset of the total cases of prostate cancer in the US. The authors used the National Cancer Data Base (NCDB), which is not a population-based sample but a subset of the US cancer cases collected from American College of Surgeons (ACoS) approved hospitals. An estimated 30-40% of the total cancer cases in the US are diagnosed in non-ACoS approved facilities. ACoS approved hospitals tend to be large facilities located in urban settings and their patients may have distinct differences from the population at risk of developing prostate cancer. NAACCR acknowledges that it is not unusual for researchers to have differing interpretations of the same data. But it is imperative that proper epidemiologic measures are used in public health research. NAACCR, along with its partners the American Cancer Society (ACS), CDC, and NCI are working together to clarify the issues raised by this methodology further delineating our concerns about the authors’ representation and interpretation of these data. The North American Association of Central Cancer Registries, Inc., NAACCR, is a professional organization that develops and promotes uniform data standards for cancer registration; provides education and training; certifies population-based registries; aggregates and publishes data from central cancer registries; and promotes the use of cancer surveillance data and systems for cancer control and epidemiologic research, public health programs, and patient care to reduce the burden of cancer in North America.